Gryphon Press - The Gryphon Press, 9780940719125, 24pp. "This book should be required reading for all cat owners Lynda Graham Barber's careful, direct words combine with Nancy Lane's beautiful, realistic illustrations to present a vivid picture of the comfort and security of an indoor cat, contrasted with the frightening, life-threatening dangers faced outdoors. 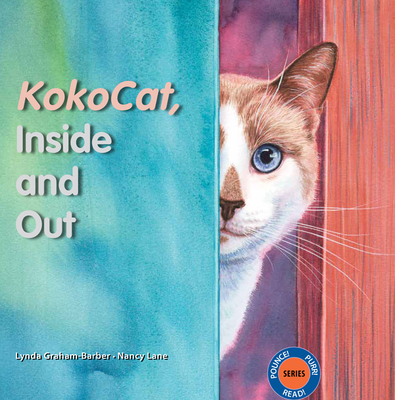 KokoCat, Inside and Out gets across an important message without "preaching," in a manner that will appeal to all ages of cat lovers as well as to the uninitiated. An important book with a vital point "
"If any lost cat deserves to be found (and of course they all do), it is KokoCat. I love the artwork and the details about KokoCat's personality. Follow her outdoor adventure and learn why it is better to be inside than out." One day, KokoCat, a well-loved housecat, sees an open door, a chance to escape her pleasant life, to explore an exciting world outdoors. Once outside, she finds that life is more frightening and less enjoyable than she bargained for. Hungry, lost, and alone, KokoCat takes shelter under a dumpster and dreams of her former life inside. In vibrant images, KokoCat's story shows the reader that keeping a domestic cat indoors is better both for the well being and longevity of the cat as well as for the birds and wild animals on which a cat preys. The book's final page for parents and adults offers important information, provocative questions, and tips to increase young readers' awareness of this important animal health and welfare issue. Lynda Graham-Barber's abiding passions for writing and animals have intermingled for four-decades, as children's book editor, writing teacher, author of thirteen books, and animal rights advocate. The author, who holds an MFA in writing for children from Vermont College, lives in a small stone cottage, which she helped build, situated on 160 wooded acres in the Northeast Kingdom, Vermont, with her artist husband David and their rescued dog Biscuit. Nancy Lane has been an award-winning illustrator for the last twenty years. Her picture books include Call the Horse Lucky and A Home for Dakota (both from The Gryphon Press). She lives in the Finger Lakes region of upstate New York with her family and her rescued dog and cats.